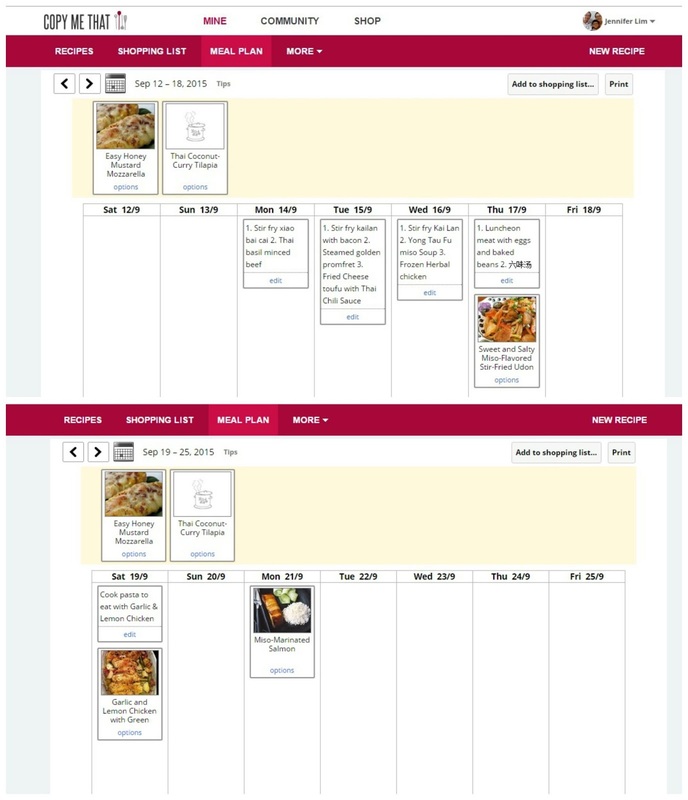 Yesterday a friend asked in one of a home cooks facebook group if there is any app that any one can recommend that has the meal planning function. A member shared that she's using an app called Copy Me That and she's also giving thumbs up for it. Of course I immediately went to check that out, downloaded the app and tried to explore it. This app runs on both iOS and Andriod so every one can enjoy it. Well, it is kinda difficult to explore in on the phone IN the office, I was afraid that my bosses will walk past my table and caught me with my face plaster to my phone. So I Google it and viola~ they have the desktop version too! Best part is the desktop version and mobile app are sync so that you can access it anywhere. The first thing you do after you set up an account with Copy Me That, either using facebook or with email, is to add the Copy Me That button onto your browser. This button can be added onto the desktop o mobile phone browsers. Once added, you will see this small icon of ladles at the top right hand corner of the browser. 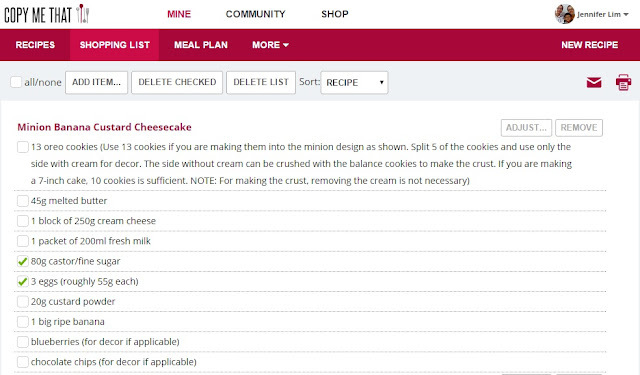 After that you can start to browsing for recipes and start saving them in Copy Me That. 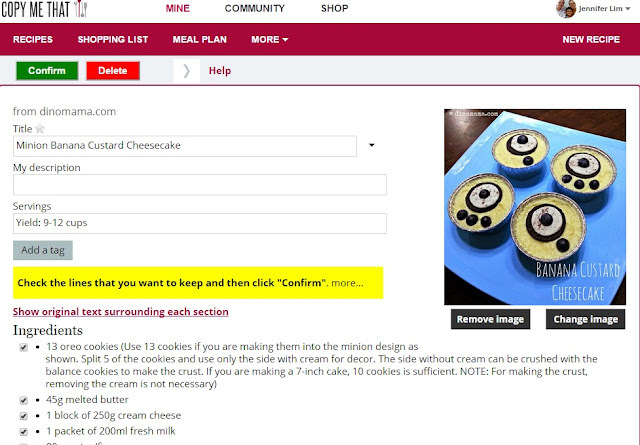 It is really very simple, for example, you found my Minion Banana Custard Cheesecake (of course I have to use my own recipe right hehehe~) and wish to make them later, just click the Copy Me That button and it will be added into your recipe page. Click on the Recipes tab at top and you will see something like the photo below. Beautiful isn't it! Every thing are being automatically imported into it plus photo too! I don't even have to do anything except minor changes or notes and to add a tag to the recipe for ease of searching in future. I can even key in recipes I printed out ages ago by clicking on the New Recipe tab on the top right corner. After you are done, be sure to click Confirm to save your recipe. By doing so you not only can edit the recipe freely but also able to add the ingredients in the recipe to the Shopping List function. The beauty of the Shopping List function besides adding all the necessary ingredients, you can choose to sort the list by Recipe or Category such as Herbs & Spices, Dairy & Eggs, Baking etc. You can also use the Add Item button to add in other stuffs you need to buy like your kitchen towel or other groceries. Thus you will have ONE Shopping List for all the necessary items you need, and get it done in one supermarket visit. No fear of printing out this shopping list and have to write a separate one for other necessities. Next, this is the most exiting part for me, Meal Plan! After you have saved your recipes, you can also send them to Meal Plan, either add them to queue (which are the recipes in the yellow box in the photo below) to be added into the Meal Plan later or add them to a specific day/date that you want to cook it. The Meal Plan also allows me to add notes on individual day, I've decided to put in the dishes that I have cooked on each day so that I will not repeat them for the next couple of weeks. It is just so simple! And to top it all, there is a Print function too so you can print out your Shopping List, Meal Plan and Recipes. 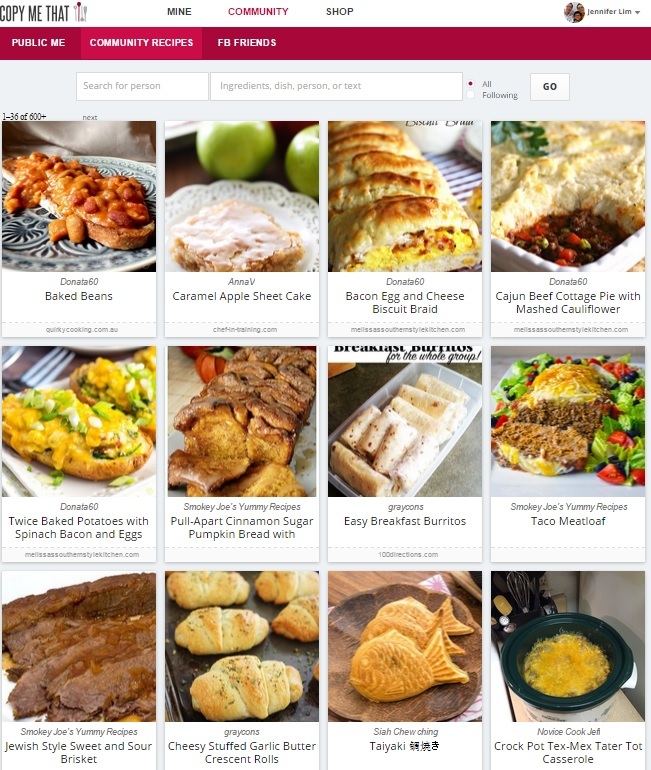 And if you are like me who love to pin recipes in Pinterest, it is even more convenient to pull out recipes from there to Copy Me That. 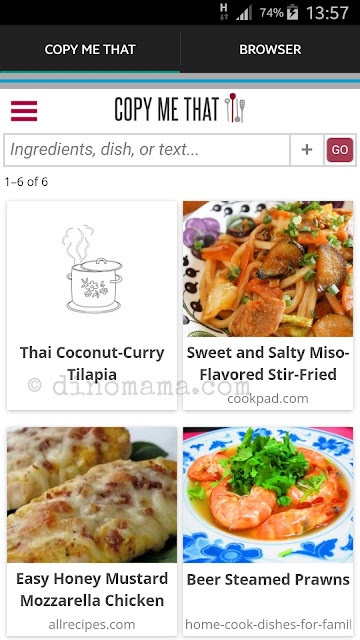 Since I started to cook for the DinoFamily about a month ago, I have wanted to do meals planning but couldn't find an app that enables me to put in the dishes AND the recipe together. I have a stack of printed recipes stashed here and there for things that I want to cook for that particular day, after its done, it is forgotten until later where I either have to hunt for it or print a new piece. Copy Me That allows me keep every thing organized under one roof. No more pieces of paper with the grocery list or recipes. I am now going to stick with Copy Me That and I will have lesser headache in planning our healthy meals in months to come! Of course, all cooks or home chefs love to share great recipes and make friends with fellow cooks or home chefs, Copy Me That has a Community where you can do just that. You can even get connected through facebook too! Seriously, for now I have yet to find anything that I do not like about Copy Me That, I am actually smiling as I am typing out this post because finally I have found something that really solve my problem and making my cooking days much more easier and stress free. Simply Copy the recipe, Plan your meals, Shop for ingredients and you are good to go for making healthy home cooked food daily for your family. Disclaimer : We are in no way affiliated to the management of Copy Me That nor are we compensated for this post. We are sharing because this is a really useful tool that all home cooks or chefs will appreciate. All opinions in this post are ours and based on our experience in navigating and using of the app.